Setting up Remote HD is a breeze. Follow these simple instructions to get up and running in no time. Remote Helper must be installed and running on all the computers you wish to access. Download Remote Helper * You may need administrative privileges on the computer to complete the installation. ** The computer must have WiFi capabilities, connected to a router with WiFi capabilities or have access to the internet. After the installation completes, make sure that you have Remote Helper running on your computer. That's it! Now grab your device and have Remote HD scan for available connections. Your computer should show up in the list of available WiFi-connections - just tap to connect! Remote HD can connect to your computer using 3G, EDGE or GPRS over the internet. This requires port forwarding configured in your internet router. Make sure that Port Mapping (on Time Capsule, AirPort Extreme or AirPort Express) or UPnP (on all others) is enabled in your internet router. Open Remote Helper preferences > Networking, and enable discovery over the internet option. Next, enable automatically configure port forwarding option in Remote Helper. If you notice a spinning wheel for a long time, uncheck this option, wait for 10 seconds and enable it again. Find out the IP address of your computer. Make a note of the make and model of your internet router. This is normally found on the underside of your router. Note: You do not need to purchase PFconfig application. Open Remote Helper preferences > Networking and click on "Test access from the internet" button. Before connecting from your iPhone or 3G enabled iPad, turn off WiFi in your iOS device. Quit Remote HD if running on your iOS device. If it is running in the background, double tap the home button to access application running in the background and quit. Launch Remote HD on your iOS device. It should automatically discover your computer and list it under "Computers across the internet" section. Tap on it to connect. Sandbox errors are caused on Jailbroken iPhone / iPod Touch devices that have pirating applications like AppSync installed. To fix the sandbox error, launch Cydia, uninstall AppSync or any such application and reboot your device. This should fix the sandbox error and enable you to purchase a full upgrade in Remote HD Lite. 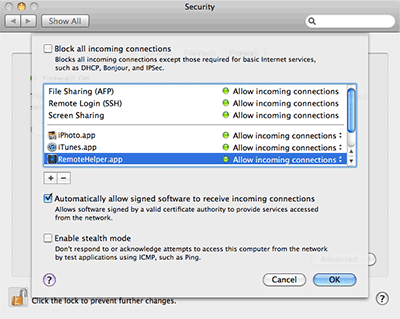 Mac computers usually do not require any changes in their firewall settings. If you are having troubles connecting to your Mac, make sure that the firewall on your Mac is at least set to "Set access for specific services and applications". Tip: Temporarily configure the Firewall to allow all incoming connections and see if you can connect. Shut down Remote Helper, if already running. Create a wireless network: this will bring up "Create a computer-to-computer network window". Give it a name. Uncheck password for now. Also make sure that you are using default settings for ad-hoc networking. These settings can be found under System Preferences > Network > Airport > Advanced... > TCP/IP, leave settings to dhcp. Open wifi settings in your iphone/ipod touch and connect to this network. Now your iPhone/iPod Touch will request a DHCP address and can take some time before you can connect. Make sure your device has gotten an IP address like 169.254.143.x from your Mac before proceeding to the next step. Make sure that Remote Helper is running on your Mac. Timeout Error can occur due to an incorrect firewall configuration even if you added an exception for Remote Helper. Please disable it temporarily to see if it resolves the problem. Try changing the port used by Remote Helper to an available port like 32700 or 32701. Then click Restart Helper button. Make sure that your iPhone/iPod touch is connected to WiFi and shows the WiFi symbol in status bar of the device. If your iPhone/iPod touch is on a public or external network, try manually putting in the host and port information into Remote HD. If you are still unable to connect, and your computer supports WiFi, try setting up Ad-hoc networking. If it still does not work Contact Us. Follow these instructions to enable audio streaming on your Mac. How do I un-install Remote Helper? Before you un-install Remote Helper, make sure that you quit it. Click on the Remote Helper icon in the menu bar and choose Quit Remote Helper. Next, open Applications folder and drag Remote Helper to Trash. Tip: You can also use Applications > Utilities > Activity Monitor to Quit Remote Helper. What is the difference between the full version of Remote HD and the lite version upgraded to a full version? Under the hood, Remote HD Lite is the same product as the full version of Remote HD, with some key features disabled. When you purchase the full upgrade from the iTunes store, Remote HD Lite enables these key features. The application name displayed in the iPhone/iPod Touch application list, will remain Remote HD Lite. The application remains linked to Remote HD Lite in the iTunes store. This has implications like you will only be allowed to rate or review Remote HD Lite instead of the full version. After purchasing a full upgrade in Remote HD Lite, if I delete and reinstall the application, will I lose my upgrade forever? Full upgrade in Remote HD Lite is marked as permanent. Even if you do not back up your device after purchasing a full upgrade and reset your device, you can safely purchase Remote HD Lite and full upgrade again from the iTunes store without getting charged twice as long as you use the same iTunes account. Is the full upgrade valid for only one device? Upgrades are not bound to a device. They are bound to your iTunes account. You can download Remote HD Lite and purchase the full upgrade on as many devices as you like. You will not be charged again as long as you use the same iTunes account. When you purchase for the second time, iTunes will ask you to confirm a payment with full upgrade price again. Go ahead and confirm the payment. iTunes will then notify you that you already own a copy of the upgrade and will deliver the download for free. Tap on the current application title to pull up Application Switcher. Press the Info button to make Remote HD ask Remote Helper for button labels of current application. Hold buttons to explore advance functionality. Like hold the forward or rewind button to fast forward or fast rewind. To enable discovery over the internet, leave the "Enable port forwarding" option enabled in Remote Helper. Use the hardware volume buttons on your iOS device to control the volume on your computer. When watching a movie, leave Remote HD running. Your device's display will go to sleep but Remote HD will remain connected. Control the volume of your computer using the hardware volume buttons, without even unlocking the device! Trackpad trails can be turned off from Settings. It will improve the performance of the trackpad. Lowering the "Remote View Quality" in Remote Helper will further speed up the Remote View! Increasing the Audio Streaming buffer from Settings will increase the lag but remove any jitters and is recommended for music streaming.